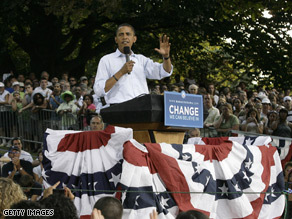 Sen. Obama spoke about change in Pennsylvania Thursday. (CNN) - Barack Obama's campaign for president has raised $10 million since Republican vice-presidential candidate Sarah Palin spoke Wednesday night, the campaign announced, calling it a "one-day record." Palin, the governor of Alaska, launched harsh attacks on Obama, accusing him of being two-faced and a political lightweight with no significant legislative accomplishments. "Coverage of the Palin attacks on the news this evening just pushed us over $10 million," Obama spokeswoman Jen Psaki said in an e-mail to reporters Wednesday night. The Republican Party announced earlier in the day it had raised $1 million in the wake of Palin's speech. I donated to a political campaign for the first time in my life today. Palin's speech is a good indication of what venal leadership we'll receive if they win this election. Go get 'em Barack and Joe! I can't thank McCain enough, for picking someone so unqualifed, so divisive, and so right-wing, that despite energizing the GOP Right-Wing base, this selection has energized the rest of the country in SUPPORT of the Obama/Biden campaign and their message of Unity, Bridge-Building between political parties, and moving the country forward TOGETHER. I just donated $25 as well. From comments on this board, I can see where the $10million is coming from. It's also shows which way this election is going. Keep talking Sarah and John!! I Am A Community Organizer and Sarah Palina - McSame Puppet, H$ate Us Hard Working Proud Americans - At Least I'm Not Pregnant At 17!!!! MORE VOTES COMING YOUR PRESIDENT OBAMA ON NOV 4TH! SAME HATE, SAME BIGOTRY, SAME POW-CARD, SAME VICTIM-CARD, SAME SEXISM AND SAME PITY-PARTY CROWD AND SPEECH! I AM WATCHING THE GAMES!!!!!!!!!!!!!!!!!!!!!!!!!!!!!!!!!!!!!!!!!!!!!!!!!!!!!!!!!!!!!!!!!!!!!!!!!! Palin reminds me of Palidin – the character in the old TV show "Have Gun, Will Travel". She got picked, which was a surprise, and was right in there, reading a speech written by McCain's team – hoping it would make her look important. All it ended up doing was turning a lot of people in this country against her nasty little speech. The 10 to 1 fund raising ratio is stunning. All the Palin scandals of last week means little, what really matters is that she has shown herself to be mean spirited, and a right wing extremist. What would America look like under President Palin and her followers? The word that comes to mind is INQUISITION.